How far along? 33 weeks. If baby weighs 4 pounds, how come I’ve gained 18? Seriously though the weight gain hasn’t bothered me as much as I thought it would. Before I was pregnant I worried about gaining a ton of weight and then not being able to loose it. But now that I’m actually pregnant it doesn’t bug me at all….it’s all about the baby! Maternity clothes? Still a mix of maternity and non-maternity. Sleep: It’s been rough lately. I wake up several times throughout the night and have a little trouble falling back asleep. I had 32 weeks of excellent sleep though, so I can’t complain! Best moment this week: Going to Ikea with my mom, starting our kitchen makeover, and birthday celebrations. Food cravings: Ice cream and fruit….so nothing new! Symptoms: Still some swelling in my fingers when I work out or when it’s hot, but that’s it. Looking forward to: We have two baby showers next week and I can’t wait! 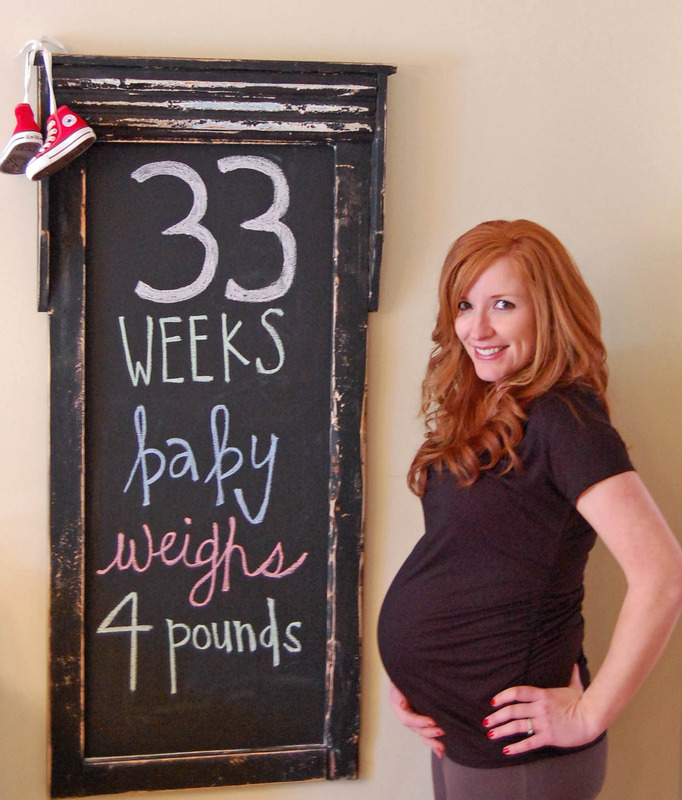 And here’s a little flashback….13 weeks, 23 weeks, and 33! So fun to see the little bump grow. You look great! I totally craved ice cream throughout my pregnancy too. Then stopped eating diary while breastfeeding, luckily I can have it again now! (still breastfeeding just doesn't bother baby anymore..) 🙂 Happy Thursday! Yayyy! I love the flashback pics, when you think of 10 weeks it doesn't sound that long, but it's fun to see that growing bump 😉 Is your shirt maternity or not? It's cute– looks comfy!! You have the perfect little bump! 🙂 So adorable! You'll be holding him in your arms before you know it! Have so much fun at your showers. Your bump is just too cute. love reading about it! 18lbs?! Oh my goodness girl, I'm a little jealous…I'm 6 weeks behind and I've got 2lbs on you! You are definitely all bump though, you look amazing. Hope you have a ton of fun at your baby showers, I can't wait to read about them! p.s. i love your chalkboard!!! All I can say is you are beautiful! Dear Julie, You look absolutely AMAZING! I am really excited to see the pics of said baby showers! You are seriously the cutest little mama to be!! You look fabulous! I can't believe you're already 33 weeks and the little guy is already 4 pounds! Where does the time go? He's going to be here before you know it! These last couple months fly by. ok I gotta say…you look great! I mean it…go on with your bad self! Wow…we neck and neck. You look fabulous. I am so glad I discovered your blog!